Important Safeway Negotiations Info Meetings Coming Soon! Your union negotiators and representatives have been hard at work since we last met. 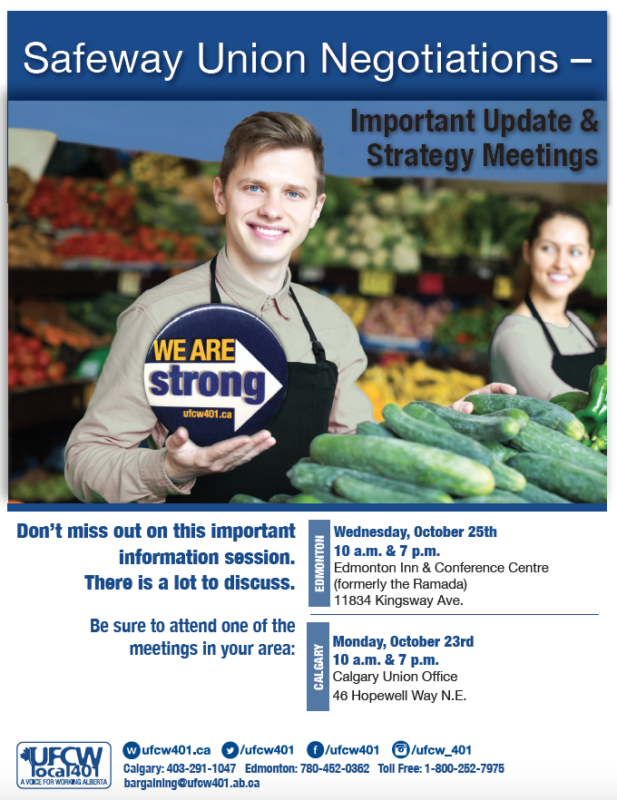 This important meeting for Calgary Safeway members is intended to update you on where we’ve been and where we’re heading. Make sure you don’t miss out. Bring a coworker with you and join the discussion on union negotiations strategy and planning; hear what your coworkers from around the province are saying; get up to date on what’s coming; have your questions answered. We are offering a unique opportunity to submit your questions prior to the Calgary meetings. Simply send your question via email to: ufcw@ufcw401.ab.ca and your question will be forwarded to lead negotiator, Tom Hesse, and he will attempt to address your issue at the meetings in your area. If you’re in Edmonton or Calgary, please join us for these special information sessions. Click on the poster below for details.